1 computer program on CD-ROM in a case. GURPS Fourth Edition lets you create any character you can imagine, from any time or place. They can be customized with hundreds of advantages, disadvantages, and skills, not to mention magic spells, psionic powers, martial arts moves, superpowers, and equipment from pitchforks to starships. 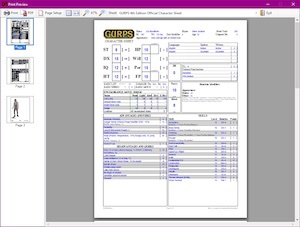 Introducing GURPS Character Assistant, created by Armin Sykes! It has every character creation rule from the Fourth Edition GURPS Basic Set. You can create and save any character, and print it out on an official Fourth Edition character sheet. GURPS Character Assistant will also let you save and share character files with other players who have GCA. Templates are also fully supported – the program will let you create, modify and share them with others. 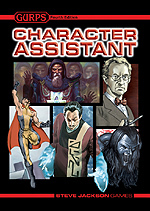 Now that you've brought your GURPS game up to Fourth Edition, it's time to bring your characters into the computer age, with GURPS Character Assistant! GURPS Character Assistant requires a computer running Windows ME (or more recent) and at least a Pentium II processor, 64 MB RAM, and 5MB free disk space. For better performance, use a faster processor and more RAM. 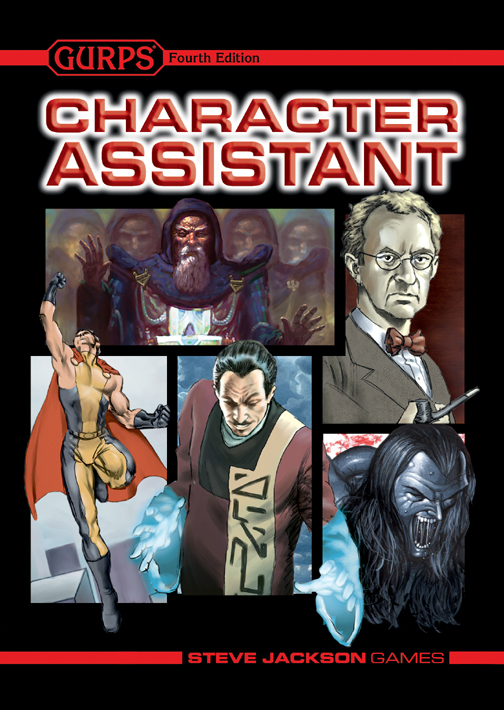 GURPS Character Assistant is also available by direct download through e23. e23 offers worldbooks, supplements, and adventures, in digital form, for GURPS – as well as many of our other game lines. Surf our site for the files you want . . . and get them instantly with a credit card! We also accept payment by PayPal, processed on the next business day. GURPS Character Assistant is now available as a 7.0 MB zipped file from e23. Check the GCA forum for announcements of updates and data file releases.